The other day I was reading a Facebook post about someone asking this, “what is drinking my hummingbird nectar every night?” It seemed that every night their hummingbird feeder was getting drained and they were getting very frustrated about it. I too had that same question several years back when I first started putting my hummingbird feeders out in my garden. It seemed that every time that I would fill the feeder up with nectar by the next morning I would find it empty and sometimes knocked down from its hanger. It was very frustrating to say the least. So I started keeping an eye out for the culprit. Each night I would check the feeder for any activity. Then one night I caught him. It was a sneaky raccoon helping himself to that sweet nectar as if I put it out there for him. That was what I suspected all along but I wanted to make sure so I knew how to take action. What did I do to remedy the situation? There are a few things that you can do. Take down the hummingbird feeder every night and bring it inside. It is a pain to have to remember but it is effective and over time the raccoons may give up coming around and then you can leave it out again. No promises on that. Get a squirrel baffle that you can place on a feeder pole. It is too hard for raccoons to climb over too. 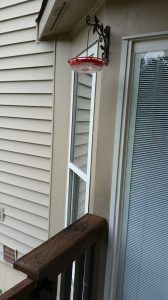 Place your feeder in a spot where a raccoon cannot get to it (our solution). For example, we have ours on a short extended hook right outside our deck door on our house siding, and high enough where a raccoon cannot reach it. There is another feeder on our patio right under the deck. No pesty critters drinking our nectar anymore! Now back to the Facebook post. People were commenting that it was probably bats doing the dirty work. Since we happen to live in the Northeastern United States, I already knew that it wasn’t bats causing the problem. We have brown bats around here and they strictly eat insects. 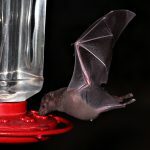 However, if you live in the Southwest United States, the species of bats that live there (the Lesser Long-nosed bat and the Mexican Long-tongued bat) thrive on nectar. 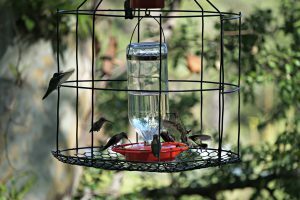 When my husband and I visit Madera Canyon in Southeast Arizona (going on our fifth year) to see several different species of hummingbirds, we stay at a bed and breakfast that has hummingbird feeders everywhere. You can sit and enjoy the hummers coming in to feed all day long. The first two years the owner would put covers on the feeders to keep the bats away. That remedy worked well but was a nightly hassle that he had to deal with. So the next time that we went we noticed that he had built cages to put around the feeders. He said that the bats could not reach the nectar but the hummingbirds could. Case solved and definitely much easier than the covers. Another suspect is a squirrel. 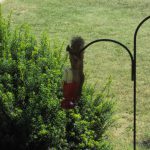 Squirrels are known acrobats and will figure just about any way to get to your feeders. From jumping from deck railings to stretching from a tree limb they will find a way. However, squirrels are out during the day so you can usually see them in action. The best way to handle these guys is to do the same thing that you would do with raccoons. 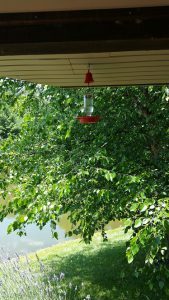 Place your hummingbird feeder in a place where squirrels cannot climb or jump to get to it (see my photos above) or get a squirrel baffle if you have yours on a pole or on a hook that extends out from your deck railing. Squirrel baffles work great for other feeders too! It is so frustrating when you want to attract hummingbirds into your garden and all you get are pesky squirrels and raccoons downing your nectar every day or night and draining your feeder. Over time this can get pretty expensive to keep up with for sure. 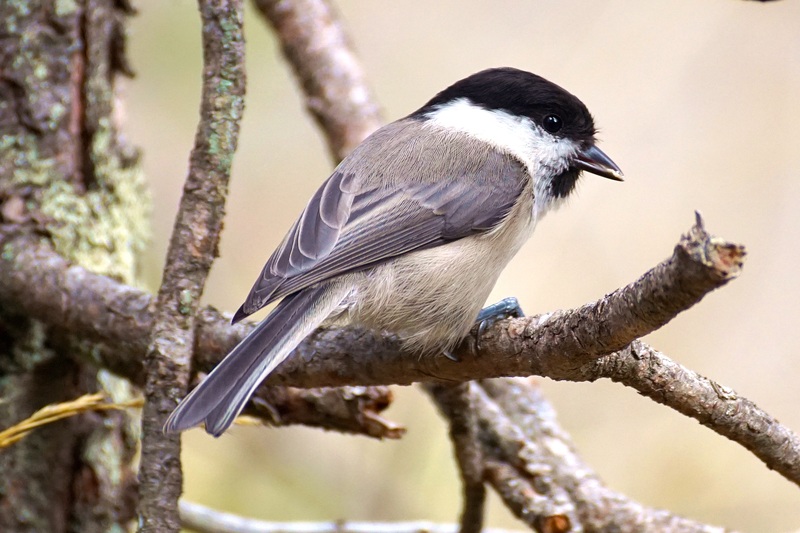 So the best thing that you can do is to place your feeders strategically out and away from trees and/or deck railings or whatever you have that these critters will climb to get to the feeder. We have ours in several different places in our garden which are unreachable for squirrels and raccoons. Don’t get me wrong, I love squirrels but I do not want them taking over my feeders all the time and keeping my birds away. Let me know what you think about this post. 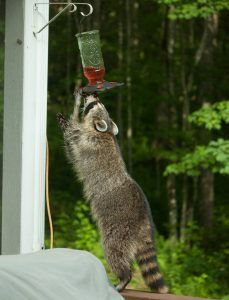 Do you have other solutions to keep squirrels and raccoons away from your nectar feeders? I would love to hear what you do. Please feel free to make your comments below. Posted in Attracting Hummingbirds, Backyard Wildlife, Bird Feeders, Hummingbirds, Wild Bird Food and tagged hummingbird feeders, hummingbirds.